Start with one of the wizards. Then use the interactive interface to create plans, analyze data and interpret results. Each plan acts as a template and allows you to save decisions. Then use the procedures specifically developed for complex samples to predict numerical, ordinal and categorical outcomes or time to a specific event. Logistic regression: predict categorical outcomes (for example, who is most likely to buy your product) while taking the sample design into account to more accurately identify groups. Ordinal regression: predict ordinal outcomes such as customer satisfaction (low, medium or high). Cox regression: predict time to an event for samples drawn by complex sampling methods. General linear models: predict numerical outcomes while taking the sample design into account. An Intuitive Sampling wizard guides you through the process of designing and drawing a sample. The Analysis Preparation wizard helps prepare public-use data sets for analysis, such as the National Health Inventory Survey data from the Centers for Disease Control and Prevention (CDC). Stratified sampling: increase the precision of your sample or help ensure a representative sample from key groups by choosing to sample within subgroups of the survey population. Clustered sampling: select clusters—groups of sampling units. Multistage sampling: select an initial sample based on groups of elements in the population; then create a second-stage sample by drawing a subsample from each selected unit in the first-stage sample. 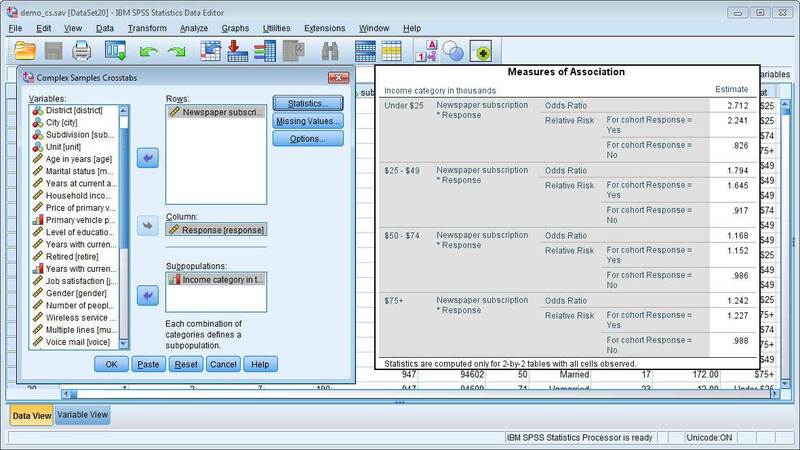 IBM SPSS Complex Samples requires a valid IBM SPSS Statistics Base license.